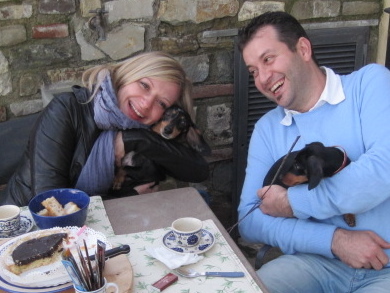 Simone and Alessia arrived around mezzogiorno, noon the other day for lunch with us in the country. The sun was bright and the air was clear with that unmistakable fall crispness. We hadn’t seen them for over a year, so it was especially fun for us to have that time together to sit and talk awhile. And even though we enjoyed our conversation, there was a bit of a distraction that occupied most of our attention. As you might have guessed from their pictures, they were not alone! Among other things, they brought a bottle of wonderful Rosé to go with the the antipasti of fried scamorza, salumi and prosciutto. Then a bottle of Tuscan Rosso, red wine for the primo, first course of pasta di zucca, pumpkin pasta. Lunch went on and on into the late afternoon. It’s a bit daunting to prepare a meal for them since they own and operate a fantastic restaurant in the Chianti region, called Malborghetto located in the tiny, quintessential Tuscan town of Lecchi. When you’re in the area, it’s a “must do” to stop in there for lunch or dinner—you won’t be disappointed, and they’re always there so you’ll have a chance to meet them in person. 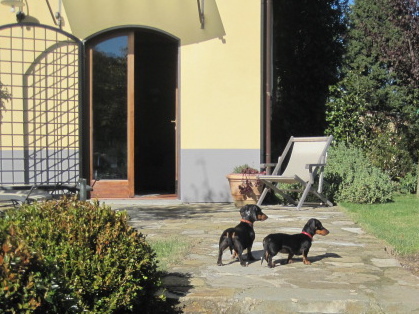 As if the two of them aren’t enough of a delight on a sunny fall day, they brought along their little bassotti, dachshunds. 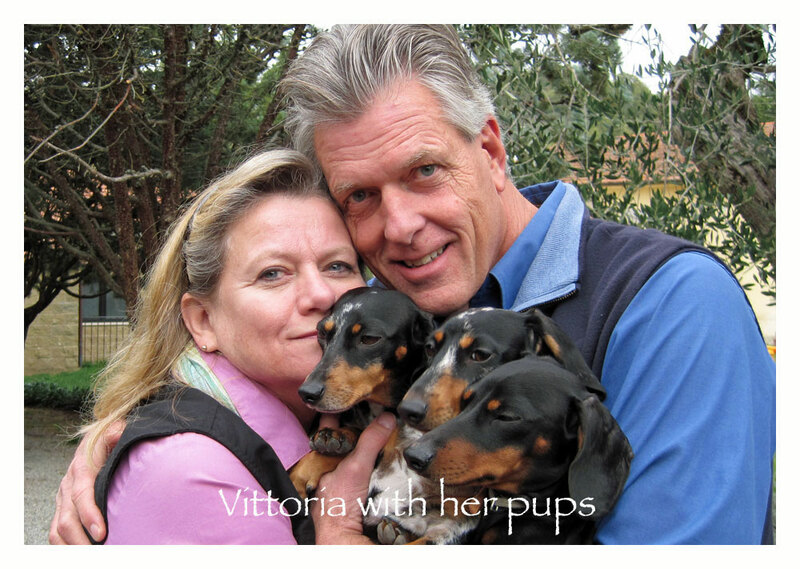 Vittoria, is an award-winning champion, and her cute little 3-month old puppy Lulù is a champion in the making. Of course, we encouraged them to bring the entire family because we’re always in need of a little “fur therapy,” since our own girls (also doxies) are with our daughter in California. 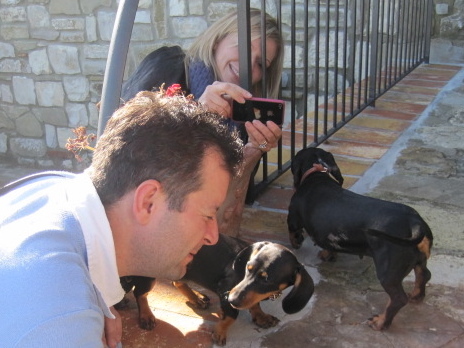 Their two sweet little doggies really filled the bill. But, to our surprise, in addition to the much needed fur therapy, we got a boatload of physical therapy along with it. We had forgotten how much energy puppies have. They were here for about 5 hours, and those two little sweeties never stopped. Well . . . okay, we did see them sit down several times to scan the yard for something exciting to charge after. And Vittoria, with her motherly duties and several years under her belt (collar) did show signs of annoyance a few times with Lulù’s repeated sneak attacks, but overall, they were two busy little boogers the entire time. For example, there was the moment when they discovered a praying mantis on a low plant by the door. Natural instincts drew them into a battle of wits and prowess—the dogs won, even though the mantis flared his wings in a most frightening display! Racing around the yard, Vittoria discovered a hole in the fence. Frantic yips resulted in an emergency rescue effort, rushing around to the neighbors yard—she survived. Then, while sneaking around the garden, they both came upon Piru the house cat, and were forced to conduct a chase down the driveway where Piru hastened into a nearby tree. Fortunately, she didn’t get frightened and freeze up there, because the vigili di fuoco, fire department probably wouldn’t have prioritized a trip to save a country cat. Of course, the cat chase was so much fun, it had to be re-enacted several times over the course of the afternoon. The highlight of the day’s festivities was the elaborate birthday celebration. Well, maybe that is a bit of an overstatement—perhaps quaint or quirky are better descriptions. 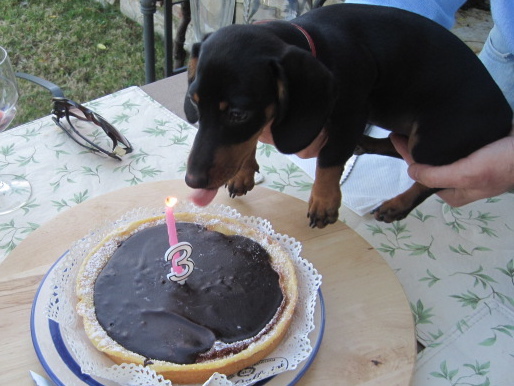 We couldn’t resist making a fuss over Lulù’s 3-month birthday. So, we had a torta di semolina, a simple flourcake, made special with a fudgey topping of chocolate. Nestled into the chocolate we placed a number 3, which held a single pink candle. Of course, Lulù had fun trying to blow the candle out (with a little help from babbo, daddy Simone). We all pitched in to help eat the cake since dessert, especially chocolate, is not in the girls’ allowable diet. 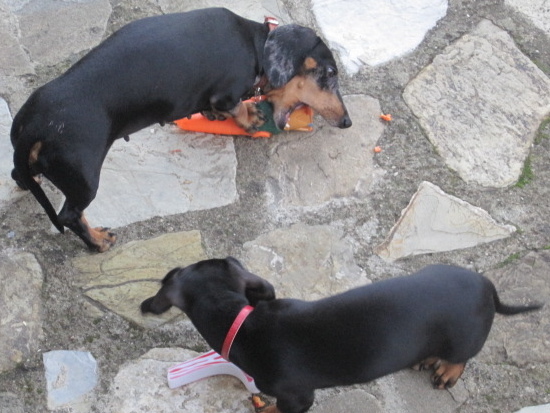 The festivities were capped off with the opening of presents which included a large box of doggie treats shaped like odd unidentifiable objects; a plastic T-bone steak squeak-toy for Lulù; and a personified carrot-king squeak-toy for Vittoria so she wouldn’t feel left out. Needless to say, we all were completely exhausted from the gala—even the girls. The party concluded and everyone seemed to have a good time. Lulù was very gracious and kept saying grazie, grazie— she just couldn’t seem to thank us enough. As they drove away, we waved goodbye to the band of birthday celebrants. The girls were already snuggled into their pillow on the backseat, curled into familiar circles as only dachshunds can form. We closed the gate and slowly climbed the stone steps back up to the house to survey the spoils of the party. We loaded the dishwasher and picked up all of the orange and white pieces of the squeak-toys which had been bitten from the edges by the little enthusiastic bassotti. Then we sat down in the cool of the early evening, recounting the many pleasant and laughable moments of the afternoon. 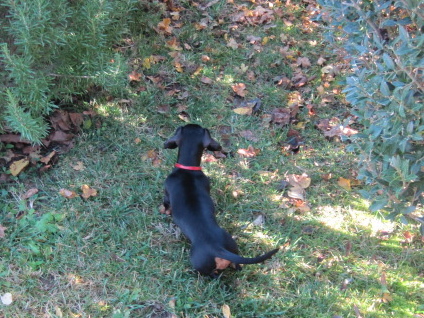 Mostly, we talked about our own little dachshunds in California awaiting our return. We smiled at the boundless energy of our two tiny guests. 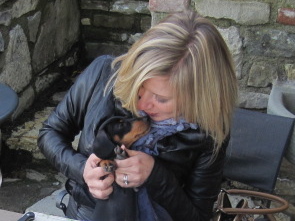 For us, it’s really impossible to see a little puppy, pick it up, hold it close, and not love the stars out of it! But, maybe it’s just puppy love. Thanks a lot for the beautiful day together and for the nice report of it. You were wondeeful hosts and we really felt at home. Ciao!!!!!!!!! The pleasure was ours and we look forward to the next visit!